A transgender teenager has had his face cut during an attack police are treating as a hate crime. 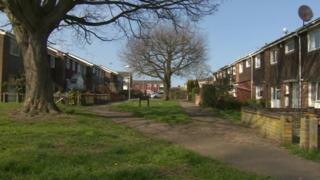 A group of teenagers verbally abused him on a footpath in Witham, Essex, before a knife was pulled. It happened in Ness Walk at about 15:50 GMT on Saturday. He managed to run away and was taken to hospital. Essex Police said they were looking for three boys aged between 14 and 15, and that one had a "significant amount of acne" on his face. The group is said to have gone to the Spa Road Recreation Ground with a push bike and left at about 16:15. Officers searched the area but were not able to find them or the knife used in the attack. Supt Tom Simons said: "We will not tolerate hateful incidents like this in Essex and I would like to commend the victim for reporting this traumatic incident. "My officers are working diligently to try and identify those responsible for this attack. "If you have been a victim of hate crime, I would encourage you to report it."